The Long Beach Unified School District's comprehensive music curriculum is enhanced by many educational partnerships, the newest of which is helping 65 students to learn instrumental music as early as second grade. The school district is partnering with the nonprofit Harmony Project, which helps to provide classical music education for children from lower-income communities. 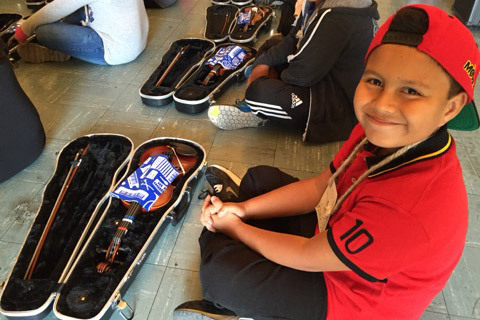 Participating second and third graders at Addams, Chavez, Edison and Harte elementary schools received new violins, violas and cellos recently, much to the anticipation of children who had been practicing how to hold faux instruments fashioned out of tissue boxes and paint stirrers. The hope is to expand the music program to as many as 200 students while adding wind instruments and continuing with intensive instruction through high school. The young musicians practice two days a week plus three hours on Saturdays for a total of seven hours of weekly instruction. The new program is made possible through a combination of fundraising via the Long Beach Education Foundation and the use of federal Title I funds for disadvantaged populations. A Dec. 3 fundraiser event for the Harmony Project, including student performances, was planned for 5:30 p.m. at Long Beach’s Terrace Theater. The cost to sponsor a child for a year is $1,500. Donations may be made online. LBUSD maintains a strong commitment to music and arts education, with $200,000 allocated to the Harmony Project. Another $3 million is allocated in the school district’s latest Local Control Accountability Plan to enhance the elementary school instrumental program districtwide, with $1 million going toward new instruments. The school district’s collaboration with arts and music organizations includes educational partnerships with the Long Beach Symphony Orchestra, which reaches more than 25,000 students annually. LBUSD students also are well represented in Southern California honors orchestras each year. Several schools have earned regional, state and national honors, including recognition by the Grammy Foundation.